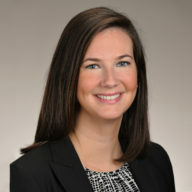 Ashley R. Kirkham provides information for claims professionals and employers in order to help prevent fines from the South Carolina Workers’ Compensation Commission. 12A First Report of Injury. 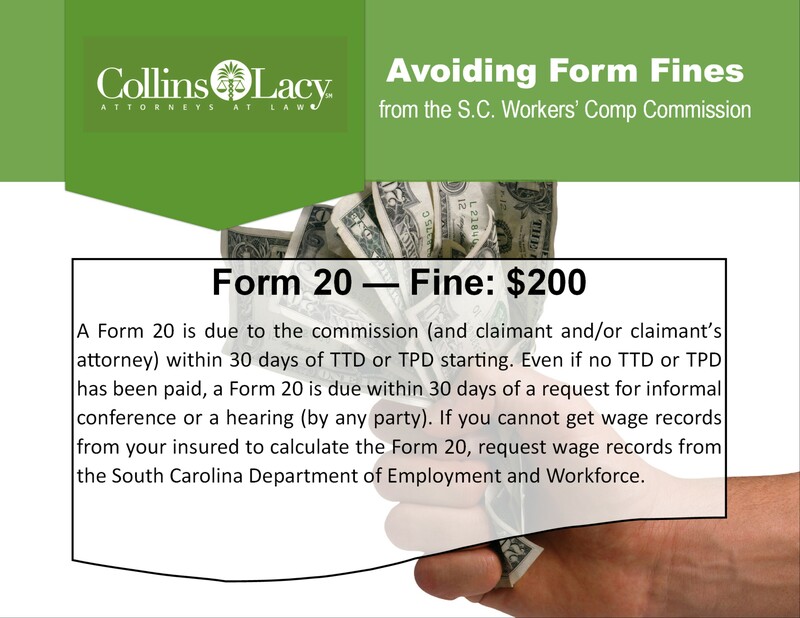 $200 initial fine, $5 per day for each additional day the form is not submitted. 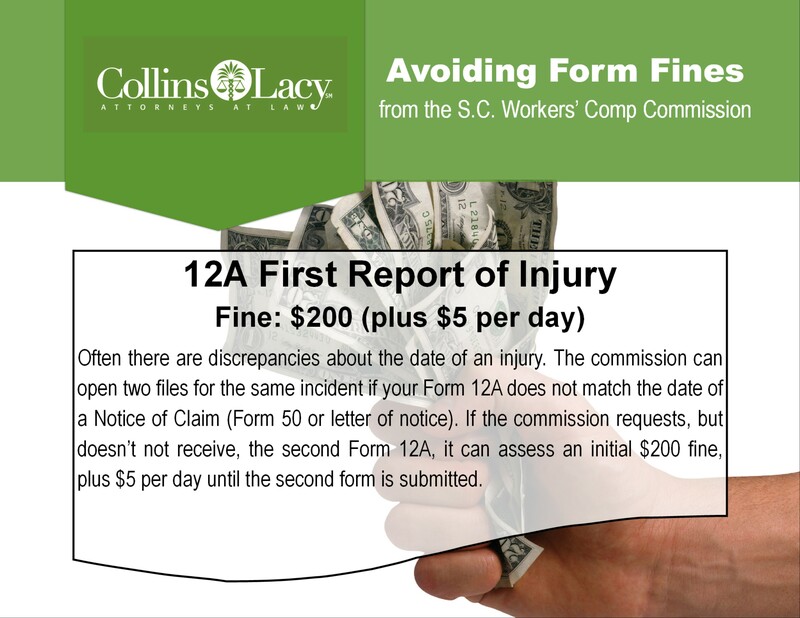 When a Notice of Claim (either by a Form 50 or letter of Notice to the Commission) is filed by an employee or his/her attorney, confirm the date of injury on the Notice with your Form 12A. If the dates of accident are not the same, a second SCWCC file will be created and carrier will be requested to file a 12A. You might receive the request and immediately ignore it because a 12A has already been submitted, which may result in a $200 fine for failing to timely submit, with an additional $5 per day fine for each additional day. If there are two dates of accident for the same injury, but you do not want to submit a new 12A for the second date of injury, you must convince the employee and/or his attorney to amend the Notice of Claim or enter into a Consent Order consolidating the two WCC claims. Form 18s are filed twice a year on the half-year anniversary and yearly anniversary of the date of accident. 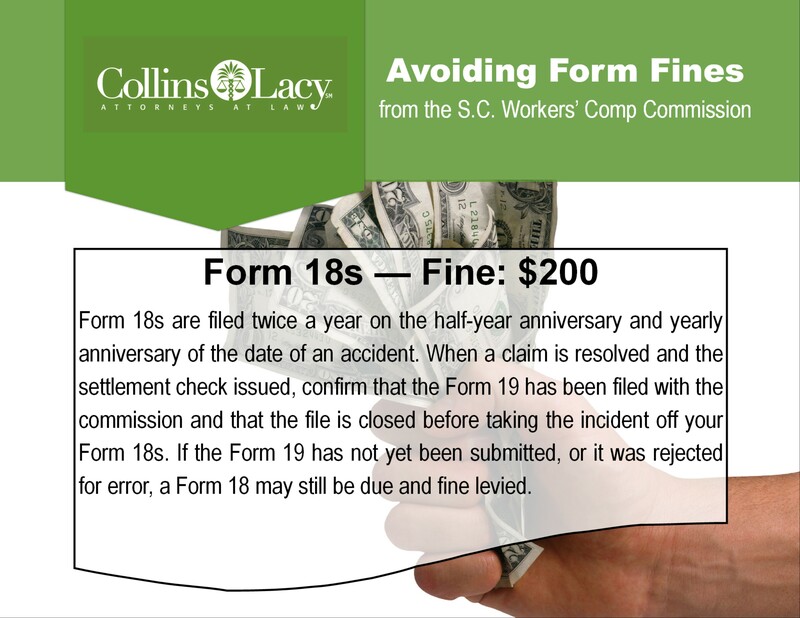 When a claim is resolved and the settlement check issued, don’t take your Form 18s off your diary until you have confirmed the Form 19 has been filed with the SCWCC and the SCWCC has closed its file. If the Form 19 has not yet been submitted, or there was an error so the Form 19 was rejected, a Form 18 may still be due. A Form 15 starting TTD/TPD must be filed with the SCWCC within 10 days of TTD/TPD starting. If a Form 18 is filed, showing TTD or TPD has been paid, this could trigger the SCWCC to confirm a Form 15 starting TTD/TPD has been filed. A Form 15 stopping TTD/TPD must be filed with the SCWCC within 10 days of TTD/TPD stopping. 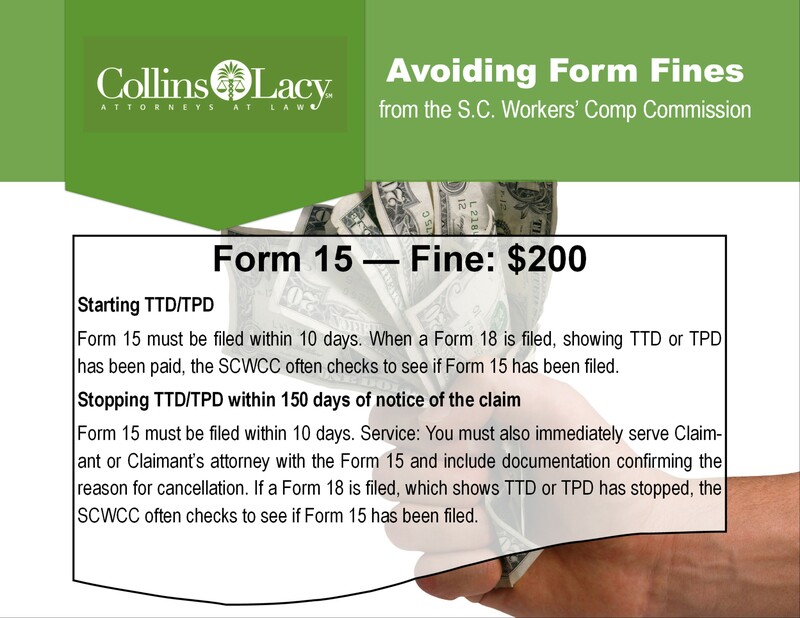 Service: You must also serve Claimant or Claimant’s attorney with the Form 15 stopping TTD/TPD immediately, and include documentation confirming the reason for the cancellation. If a Form 18 is filed, which shows TTD or TPD has stopped, this could trigger the SCWCC to confirm the Form 15 stopping TTD/TPD has been filed. When an employee returns to work after 150 days of notice of the work injury, no additional TTD is owed. But, you must have the employee execute a Form 17 officially stopping TTD. The Form 17 executed by Claimant to officially stop TTD is due to the SCWCC within 31 days of the claimant returning to work. 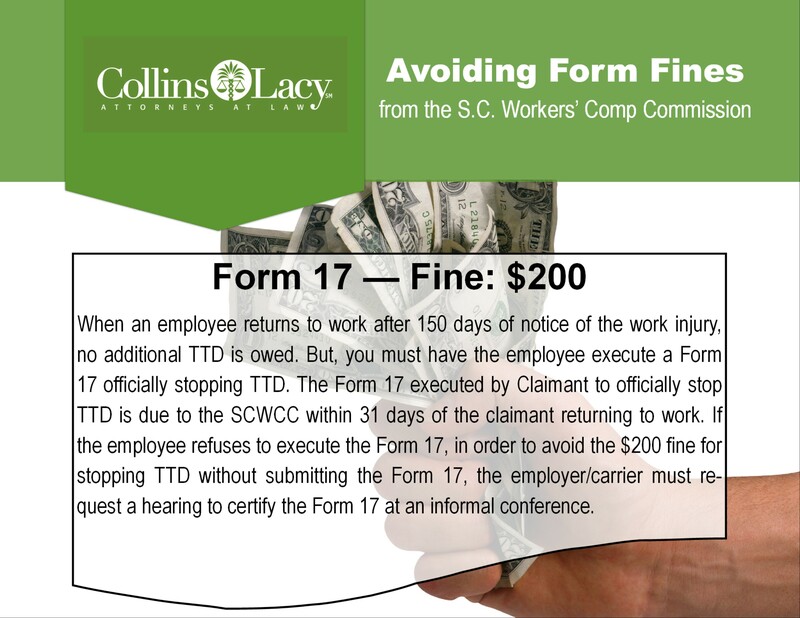 If the employee refuses to execute the Form 17, in order to avoid the $200 fine for stopping TTD without submitting the Form 17, the employer/carrier must request a hearing to certify the Form 17 at an informal conference.